As the darkened leaves blew across the River Taff yesterday, it felt like a proper Autumn day in the Welsh capital. 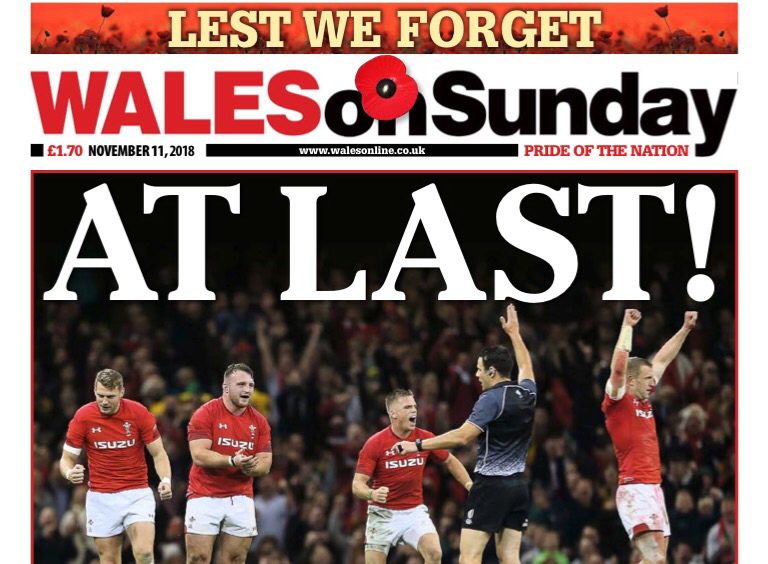 A feeling of deja vu as yet again Wales faced the Wallabies, a fixture that used to be so rare, and exotic, but these days is an almost annual occurrence, but on this occasion, after thirteen consecutive defeats Wales were the victors. 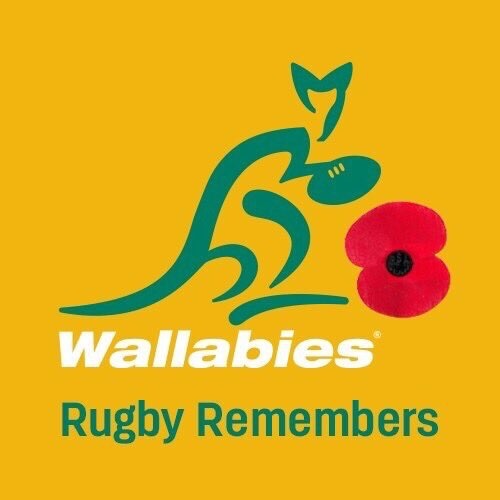 On the eve of Remembrence Sunday it was appropriate to reflect on darker times, when Wales and Australia united, and fought a much tougher battle, on foreign fields, where many of them would pay the ultimate price. 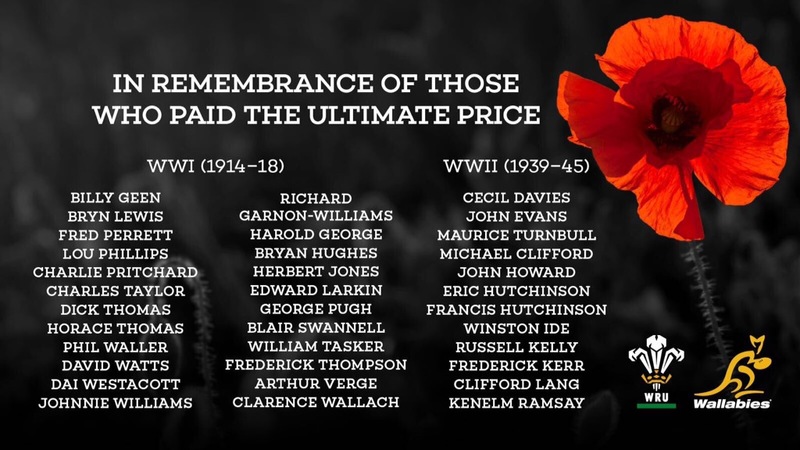 I hope this roll call will continue to keep the names of those heroes alive, and remind us that when all is said and done, there are much more important things in life than rugby, and although at times this is something we all tend to forget, one thing is for certain, we should always remember those brave men listed below. Born: Ferndale, 14 October 1883. Killed in action : Mametz Wood 7 July 1916. Born: Whitchurch, Cardiff, 3 January 1882. Died of wounds: Corbie 12 July 1916. Born: Cardiff, 10 October 1882. Killed in action: Wieltje, 28 August 1917. Born: Pentyrch, 28 July 1890. Killed in action: Ancre, 3 September 1916. Wales : Two caps, 1912-1913. Born: Llowes, Radnorshire, 15 June, 1856. Killed in Action: 25 September 1915 while leading his battalion at the Battle of Loos. Born: Ruabon, North Wales, 8 May 1863. Killed in action: 24 January, 1915 at the Battle of Dogger Bank when his ship HMS Tiger was hit by fire from German cruiser SMS Blucher. Born: Newport, Monmouthsire, 24 February 1878. Killed in action: Cambrai, on 14 March 1916. Died of wounds: 14 August, casualty clearing station, Western Front. Born: Bath, Somerset, 28 January 1889. Killed in action: Hit by shellfire, 14 December 1917, Arras. Born: 4, January 1891, Pontardawe. Killed in action: 2 April, 1917 Ypres, France, hit by shellfire. Born: 14 March 1891, Newport, Monmouthshire. Killed in action: Hooge, Flanders, 31 July, 1915. Born: Briton Ferry, 9 May 1891. Died of wounds: 1 December 1918, in a clearing station weeks after the armistice. Born: Maesteg 14 March 1886. Killed in action : 14 July 1916 at Bazentin Ridge, France.